Headlines is a charitable organisation based in the UK which aims to provide support and help to all those affected by Craniosynostosis (both syndromic and non-syndromic) and associated conditions. Craniosynostosis is evident when two or more of the plates in the skull fuses, normally before birth, resulting in problems often requiring surgical intervention at a young age. Some conditions require ongoing surgical as well as other medical treatments into early adulthood. Craniosynostosis affects 1 in 2000 births and up to 350 children are born with this condition in the UK every year. Syndromic craniosynostosis which includes conditions such as Aperts, Muenke, Crouzons and Pfeiffer Syndromes are even rarer. 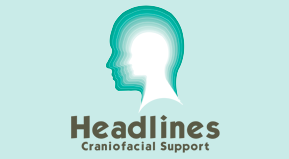 Headlines provides patient information on the various conditions, a confidential helpline, and by working closely with specialist health professionals, is able to support children, adults, parents and carers through their craniofacial journey. Headlines also supports an annual medical conference to which all members are invited to attend. Headlines raises awareness of craniosynostosis and associated conditions through the publication of its member magazine and newsletters with real life stories from members living with these conditions, and by working in partnership with other organisations to spread the word. Headlines offers members the opportunity to get together in informal environments such as at the Annual Family Weekend where families are able to share their experiences whilst having fun at an outdoor adventure centre. Local events for families and young adults are also planned for 2018.